This is good. No, scratch that. This stuff is the most AMAZING pasta salad ever!!! 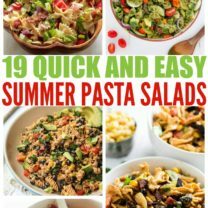 Great ready for the best pasta salad recipe! 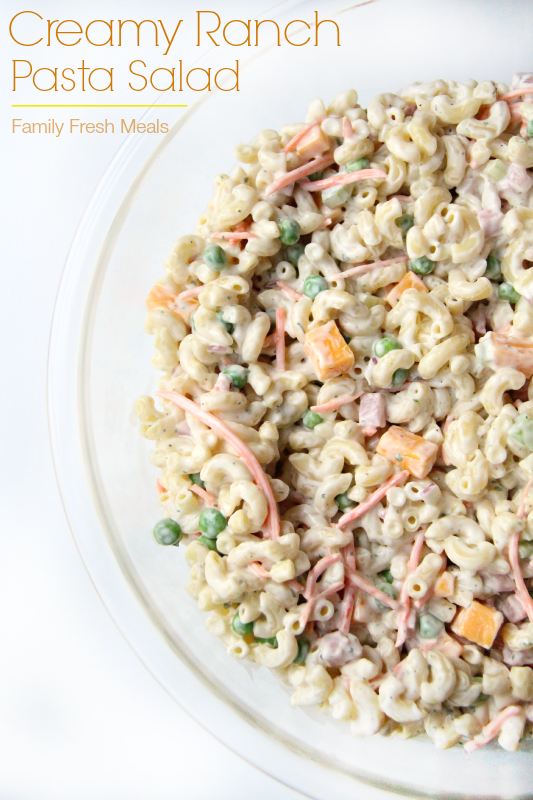 Have you been on the search, for the creamiest, most flavorful pasta salad? I know I have….for quite some time now. Well, seeing as I’m a bit obsessed with ranch flavored recipes, I just HAD to put a ranch spin on a pasta salad. 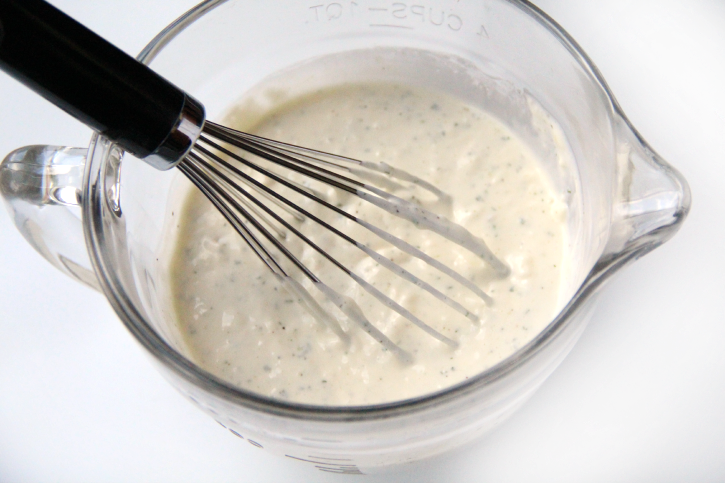 To make the dressing, whisk together ranch mix, mayo and milk. Mix until all lumps are gone. Once pasta is done, drain and let cool for a couple minutes. 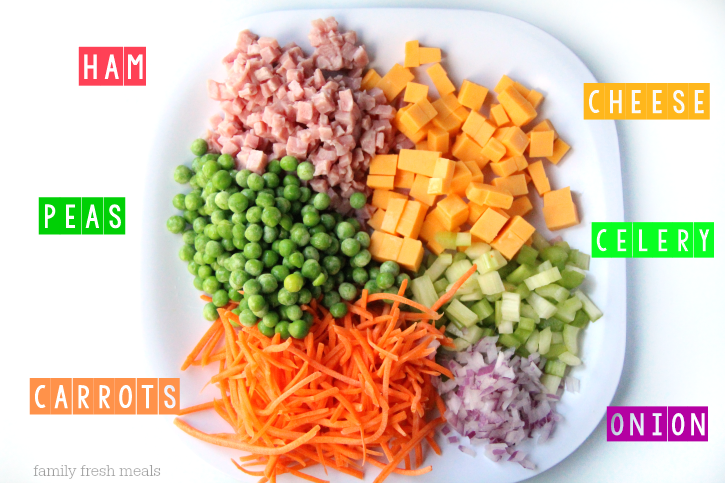 Once cooled, mix in carrots, celery, red onion, frozen peas, ham and cheddar cheese. Next pour dressing over the pasta salad, and stir gently until well combined. Cover and refrigerate for at least 1-2 hours before serving. 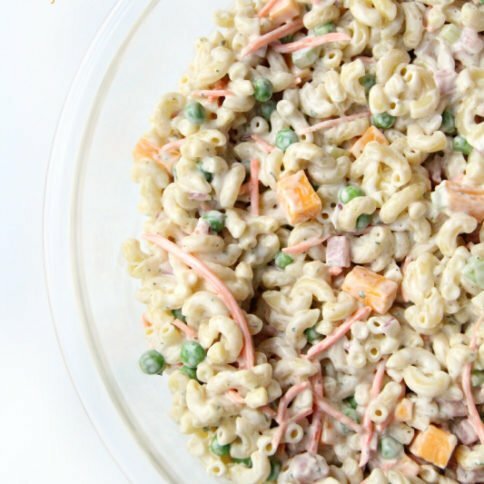 Right before serving, give your Creamy Ranch Pasta Salad a couple more stirs to mix in any of the dressing that had settled at the bottom. 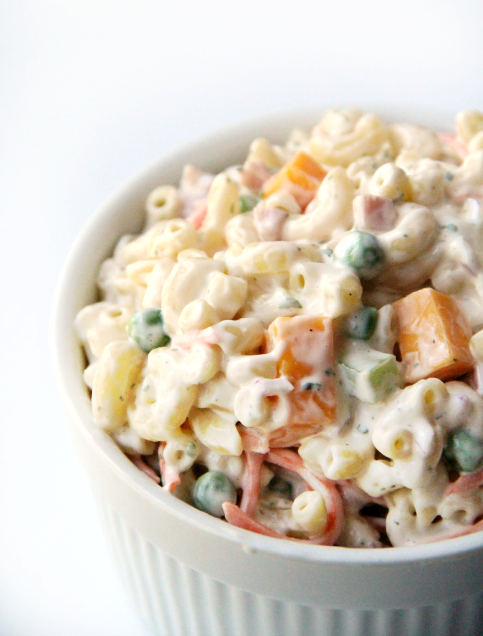 Here is my rendition of the best, most creamy pasta salad out there. 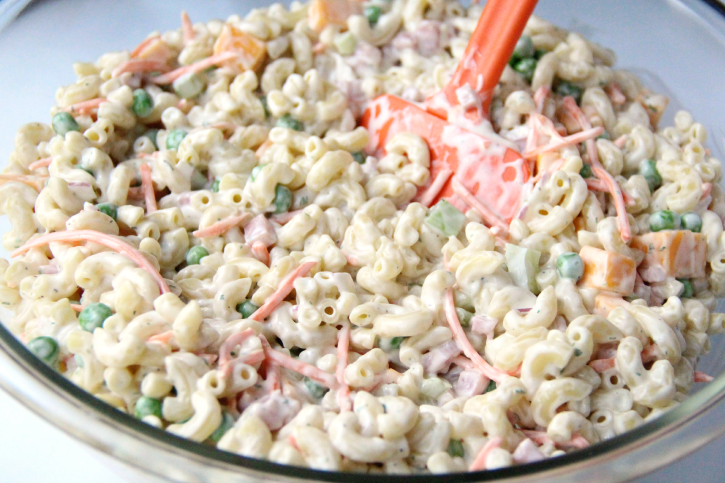 This Creamy Ranch Pasta Salad is perfect for anyone who loves pastas salad and ranch! 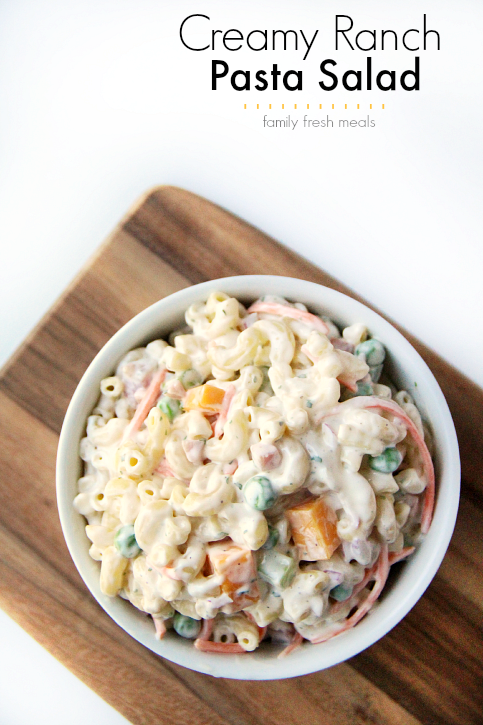 Here is what I used for this Creamy Ranch Pasta Salad! 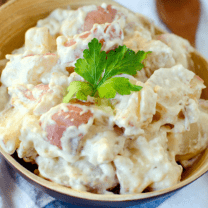 Hey- looks like this will be a great combo to your crockpot BBQ chicken!! How do keep coming up with these yummy dishes? Wow! Can I make the night before? I just made this and it is amazing! I love all your recipes, especially the ranch ones. Thanks for posting such great recipes! Can I substitute shrimp for the ham instead? Would it be just as good? Sounds interesting! I don’t think I have ever had ranch flavored shrimp dishes before. 🙂 If you give it a try, please let us know how it tasted! 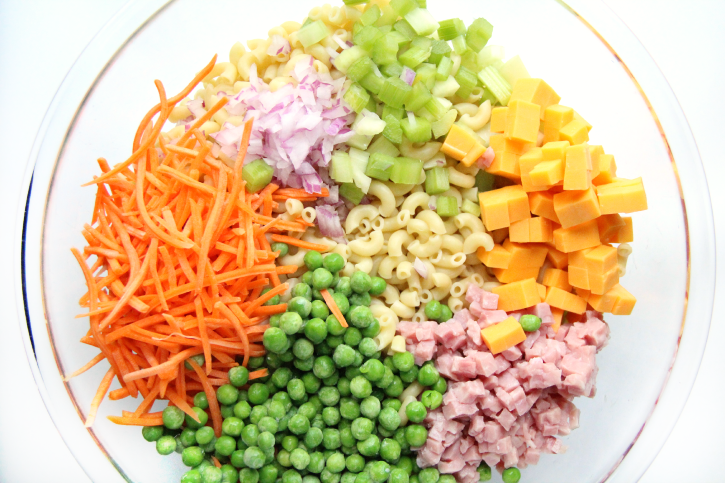 Just made the pasta salad…it’s delish..added a few chopped dill pickles . Yummy! 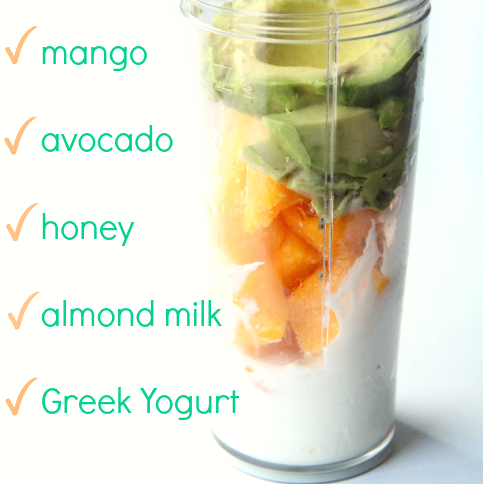 Anyone tried this with greek yogurt instead of the mayo? Delicious! I made this to take for lunches to work for the week. It made a TON. Haha. It’s definitely one of my favorites. Thanks a lot! Why do the peas have to be frozen? What kind of ham do you use without baking a whole ham and using leftovers? Thanks. Thanks Carrie! I love the idea of using pepperoni!! I don’t have any ranch seasoning but I have ranch dressing. Could i use the dressing instead of the seasoning? I have only made this with the seasoning Anthony. Sorry. Can anyone else help Anthony out? Yay! This was yummy and so easy. Thanks for sharing Corey. I made a batch and grilled up some chicken and tossed that in. 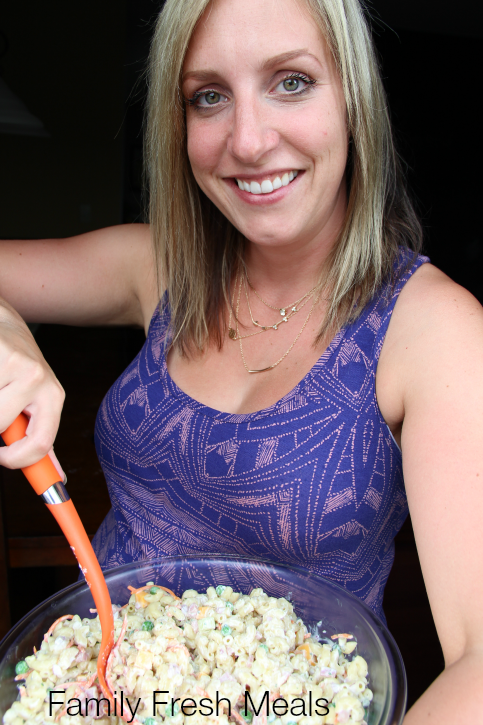 I took a big bowl to work to share and everyone really liked it. Love all the veggies for crunch and the ranch flavor! I used bowties cause that’s what I had and I love the shape. Once the noodles soaked up a bit of the sauce, there was the perfect amount left. Love chilled main dishes for summer! Hope you’re having an awesome day. I love the idea of adding chicken! YUM!! Does it matter if you use the salad dressing & seasoning mix or the the ranch for dips seasoning? This is a really good recipe, but understand it makes ALOT! My husband just loves it. How many ounces are in your seasoning packet that you use? I wondered the same thing because theres a one ounce or three ounce pkg.. This sounds similar to a salad in the deli at one of my favorite stores. They add hard-boiled eggs and use rigatoni noodles. I think this is the closest I have found to that recipe. Thanks for sharing. This looks delicious and I will definitely be trying it! 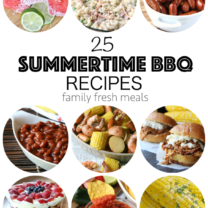 I love recipes like this for easy summer meals. One word of caution though. My frozen peas warn that they should be cooked in order to kill bacteria…so I think I would run mine though some boiling water, just to be safe. 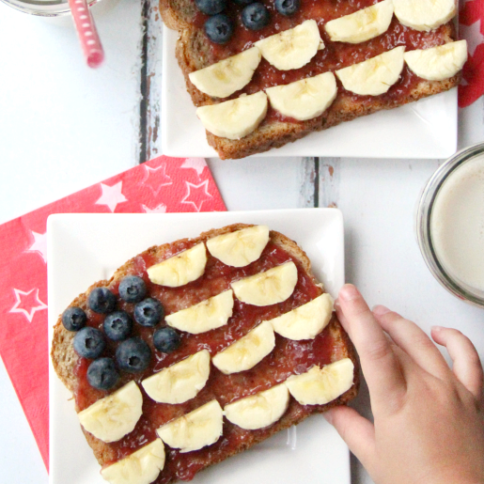 Have made this twice now for summer pool parties…I have some picky party goers but everyone loves this! Thanks for an easy and tasty pasta salad!